Sometimes an idea is so bad, or an argument so poorly conceived, that not only is it not right, it lacks even the decency of being wrong. Some arguments are so utterly confused that they are appropriately derided for being not even wrong. One of the bedrock foundations of science is that all claims must be testable. Any claim that cannot be tested, as in this gobbledygook (supposedly*) uttered by Deepak Chopra, "We are each a localized field of energy and information with cybernetic feedback loops interacting within a nonlocal field..." falls outside of the scope of scientific inquiry. Despite coopting some scientific sounding phrases and concepts, Deepak's word salad is unintelligible and literally adds nothing meaningful to any serious scientific endeavor. It is not just wrong. It is worse than wrong. It is completely useless. The phrase, not even wrong, is attributed to Wolfgang Pauli, a theoretical physicist and a contemporary of Albert Einstein's. An interesting note about Pauli, and part of the inspiration for the broken telescope in my tattoo, is that experimental equipment was said to break whenever Pauli would visit a lab. Pauli earned such a reputation for this that the phenomenon earned its own name, "The Pauli Effect." 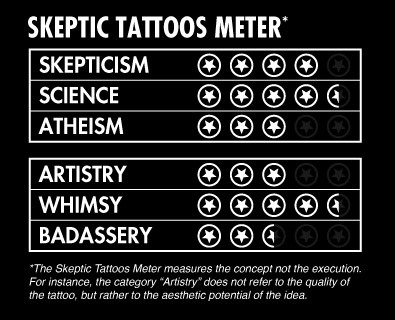 The not even wrong tattoo gets high marks for science and whimsy for obvious reasons, but not even wrong also provides a powerful Skeptical retort to unintelligible claims masquerading as science. * I have not been able to verify that this quote was ever actually uttered by Deepak Chopra. I have seen several articles that attribute it to him, but I also saw that the attribution was disputed on RationalWiki. I could not find the original source where the quote was taken from. In any case, the quote is emblematic of the scientific sounding, meaningless word salads that are commonly offered up by new age and paranormal proponents. Learn more about the expression, not even wrong.